Fundamental physics has been challenged for decades by (1) the unification of General Relativity (GR) and of Quantum Physics (QP), and more recently by (2) the discovery of the acceleration of the expansion of the Universe. Known theories trying the reconcile GR and QP, e.g. string theory often introduce new scalar fields that could be detected through an associated fifth force. Similarly, the accelerated expansion of the Universe can be explained either by introducing a cosmological constant in Einstein’s equation, or alternatively by introducing extra fields that affect the Universe’s dynamics on cosmological scales or modify GR. 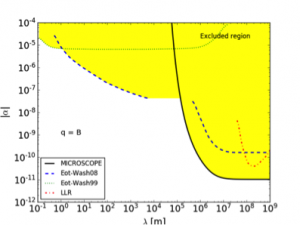 However, the fifth force created by an extra field, if it affects the Universe on its larger scales, should also affect its dynamics on small scales, which contradicts past and current tests of GR. 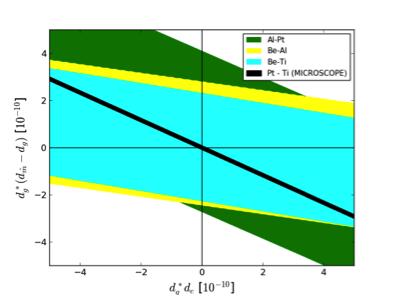 To avoid violating GR on smaller scales, screening mechanisms have been designed, that cancel the effect of the fifth force so that new theories are consistent with GR at the level of the current experimental constraints. One of the most stringent of these tests tackles putative violations of the equivalence principle which could occur in theories with certain types of screening, e.g. chameleons. 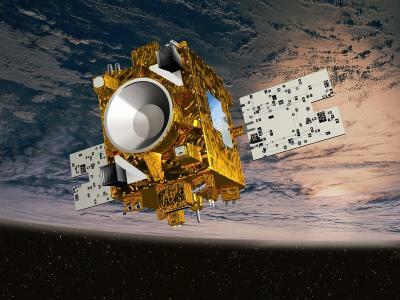 MICROSCOPE, launched on April 26, 2016, will perform a test of the Weak Equivalence Principle by measuring the Eötvös parameter down to 10-15, two orders of magnitude lower than the best current constraints. As theories with an extra scalar field may violate the WEP, this mission will allow for new constraints on the presence of such scalar fields. In particular, the chameleon screening mechanism could be tested. The Lunar Laser Ranging Experiment and planetary ephemerids yield tight constraints on deviations from GR in the Solar System. In particular, it is possible to constrain other screening mechanisms such as the Vainshtein and K-mouflage ones as they affect the orbits of planets and interplanetary probes. 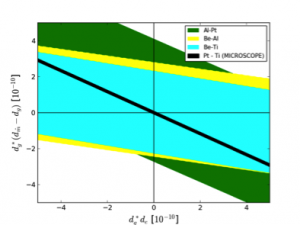 Cosmological surveys bring complementary constraints, as Modified Gravity (MG) affects structure formation. For instance, massive galaxy cluster counts and measurements of the matter power spectrum can discriminate against LCDM and MG models; therefore, making it possible to constrain different screening mechanisms. Earth orbit scale: constrain the chameleon mechanism with MICROSCOPE. Solar System scale: development of an instrumental concept to experimentally constrain MG and screening mechanisms. Cosmological scales: constrain MG and screening mechanisms thanks to their effects on structure formation. MICROSCOPE’s first results were published in December 2017 (Touboul et al 2019). No violation of the Weak Equivalence Principle (WEP) was detected above the 2×10-14 level. We translated this new upper bound into constraints on the characteristics of a new Yukawa-type interaction and of the string-theory dilaton (Bergé et al 2018a). The Yukawa potential is defined as V(r) = a/r exp(-r/l), where a is the dimensionless strength of the potential and l is its range. The dilaton is a scalar partner to the graviton that appears in higher-dimension theories (like string theory); it has been shown to couple to matter in a non-universal way, thereby implying WEP violations (Damour & Donoghue 2010). MICROSCOPE allowed us to shrink the allowed values for their parameters (Fig. 1). Figure 1: Left: Excluded region of a Yukawa potential before (dashed lines) and after (solid line) MICROSCOPE. Right: Allowed values for the dilaton couplings before (colored areas) and after (black area) MICROSCOPE. We are currently investigating how MICROSCOPE can put new constraints on some scalar-tensor theories, where a new scalar field degree of freedom is added to General Relativity (GR). They are good candidates to explain the accelerated expansion of the Universe, but are already highly constrained by Solar System scale tests of gravity. In order to pass them, they must allow for the chameleon mechanism, wherein the scalar field acquires a high mass in high-density regions, therefore suppressing its interaction with matter. An extra screening mechanism is added to the environment dependence of the chameleon: the scalar field is frozen inside massive objects (such as the Earth), and only a thin shell about the edge of the object sources the exterior field profile. Under right circumstances, this thin shell screening (or absence thereof) can prompt WEP violations (see e.g. Khoury & Weltman 2004). It was expected that space tests of gravity can improve the constraints on the chameleon mechanism. Instead, we find that those expectations were based on the simplistic assumptions that test masses are directly in the vacuum and that the atmosphere is a step function. Using more realistic assumptions (the atmosphere’s density has a non-trivial dependence with altitude, the test masses are inside an instrument which is itself housed by a satellite) significantly complicates all calculations, which then require numerical simulations. Taking all this into account in the MICROSCOPE case is the main work of PhD student Martin Pernot-Borras. We find two possible regimes depending on the true characteristics of the chameleon: either the field is heavy and is screened by the MICROSCOPE satellite, or it is light and can be felt by the MICROSCOPE test masses. In the former case, the test masses are oblivious to the chameleon field sourced by the Earth, so that no violation of the WEP can be detected; in the latter case, the test masses see the chameleon field, and a violation of the WEP could be sourced by the chameleon. Previous experiments have already excluded the main part of the parameter space for which MICROSCOPE could detect a violation of the WEP (see e.g. Burrage & Sakstein 2018). Nevertheless, MICROSCOPE may be sensitive to a region still not probed by any experiment. More precise simulations are needed to put new constraints on the chameleon (Pernot-Borras et al in prep). Finally, we investigated how the imperfect knowledge of the source of gravity can affect the search for a 5th force. We focused on searching for Yukawa-like deviations to Newtonian gravity in the vicinity of the Earth (Bergé et al 2018b). We showed that the (modified) gravity field can still be expanded in terms of spherical harmonics, but with a significant difference compared to the pure Newtonian case: the shape factors such as the quadrupole J2 depend on the distance to the Earth, and are thus not universal to the Earth system. This can hint to new ways to test gravity, by measuring the Earth gravity field at different altitudes and compare the spherical harmonics coefficients: they should be the same in a pure Newtonian frame, but any difference may hint to a Yukawa-like interaction. However, this exercise largely depends on the combination of different measurements, none of those that are currently available looking clean enough to allow for a clear measurement of a Yukawa interaction. This work shows that one cannot easily use published geodesy results to constrain fundamental physics, but that instead, one should consider space missions focused both on geodesy and fundamental physics. Conversely, we computed the effect of a possible Yukawa interaction on geodesy measurements (based on currently allowed values as shown in Fig. 1). We found that the effect is still negligible, two orders of magnitude below the current precision of space geodesy surveys. In particular, this work is of importance for the ISLAND project, since it shows that we should go beyond the point-mass source hypothesis usually used to constrain a Yukawa interaction in the Solar System. Until 2016, our work on MICROSCOPE within UnivEarthS was focused on how to take data gaps into account, with the added difficulty that the MICROSCOPE noise is strongly colored. Those gaps come in two flavors: missing data and masked data. Some data points are indeed removed (masked) from the measured time series because they are corrupted by external events, such as impacts by micrometeorites or crackles of the satellite’s coating. We therefore adapted the inpainting algorithm, and developed the KARMA and M-ECM algorithms. Inpainting and M-ECM allow us to fill in gaps, whereas KARMA is a generalized least square technique that takes gaps into account in the context of colored noise. In 2018, we finalized the verification, on realistic simulations, that those three techniques provide similar results and allow us to measure MICROSCOPE’s instrumental parameters and a possible violation of the WEP with the required accuracy. In 2017, we introduced the use of “exponential shapelets” to model and subtract transients instead of masking them. This allows for a cleaner consideration of the instrumental noise, since we do not have to fill gaps with artificial data. Shapelets are basis functions defined as Gaussians weighted by Laguerre polynomials. They were introduced by Refregier (2003) and Massey & Refregier (2005) in the context of weak gravitational lensing data analysis. Exponential shapelets follow the same design principle: they are defined as exponential functions weighted by Laguerre polynomials, and are therefore better suited to model fast-decreasing objects, like the transients observed in MICROSCOPE data. Although we showed that they do not enjoy the same mathematical properties as the original shapelets, exponential shapelets give encouraging results (Bergé et al in prep). While the work on the exponential shapelets formalism was undergoing some delay (but should be submitted as a paper by the end of the year), we investigated the statistics of transients in MICROSCOPE data. The work was performed with the help of M1 student Nicolas Touquoy (Paris Sud University). In particular, we looked for a correlation between the distribution of transients and the position of MICROSCOPE along its orbit. We found no correlation with the longitude, but a clear correlation with the latitude, with more transients close to the poles than close to the equator. This hints for a thermal origin of transients, since the Earth albedo is strongest close to the poles; this tends to confirm that most transients are indeed due to crackles of the MLI coating of the satellite. We also looked for a correlation between the number density of transients and the orientation of the satellite. Interestingly, the data tends to show such a correlation, with more transients when the x-axis of the instrument is orthogonal to the nadir (Fig. 2). Although we are still working on the origin of this distribution, this may mean that some sides of the satellites are more prone to give rise to MLI crackles. Fig. 2 also shows this distribution for different dates spread over one year of data, i.e. for different configurations of the Sun-Earth-satellite system. No seasonal variation can be seen, hinting for a purely local (Earth-satellite system) origin of the transients. Figure 2: distribution of MICROSCOPE transients vs the satellite orientation with respect to the Earth, for several dates spread over one year.